For custom-built applications, using a Platform-as-a-Service (PaaS) solution is an excellent option. 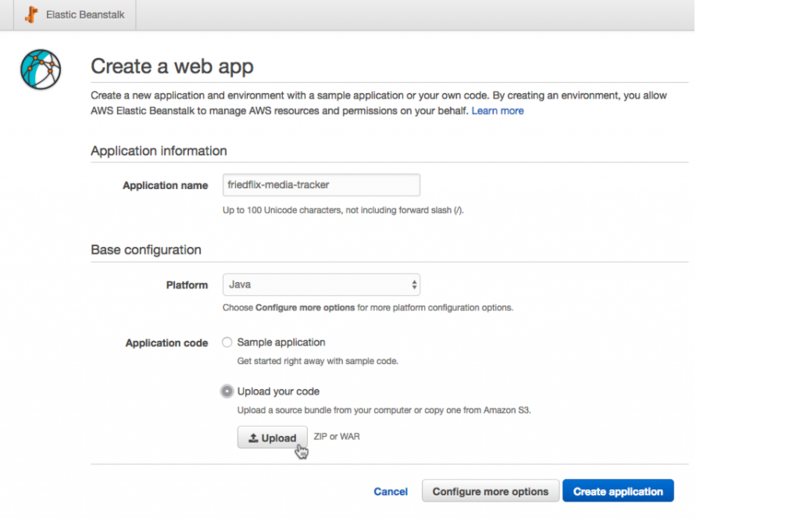 With a PaaS, developers simply focus on writing code and pushing an app. It removes the complexity of having to build and maintain any underlying infrastructure. Use a PaaS offered by a public cloud provider. All the big cloud players have a host of services covering the entire software stack. This includes PaaS, and customers may choose to host applications there. Use a third-party PaaS on top of an IaaS provider. The alternative is to use a PaaS that can run on many infrastructure providers. The most notable option here is the Cloud Foundry platform. I’ll assess three public cloud provider offerings (AWS Elastic Beanstalk, Microsoft Azure App Service, and Google App Engine), and one third-party option (Pivotal Cloud Foundry). My goal here is not to determine which option is better. To be clear, I’m not going pick a favorite at the end. I won’t examine the merits of portability or vendor lock-in. Nor am I interested in getting into a public cloud vs. private cloud debate. I’m also not evaluating price or performance. First I needed an application to deploy. For this exercise, I built a very simple one. It’s a web service to keep track of movies and television shows that my family and I have watched or want to watch. I call it Friedflix Media Tracker. I could have used a starter app or someone’s example code. It would have saved me time and headaches. Instead, because it’s been a while since I’ve written Java, I took the opportunity to learn something new. So I wrote a simple REST endpoint using Spring Boot. To get a more real world experience, I decided to use a persistent datastore as well. (I haven’t yet decided if I regret that decision or not.) 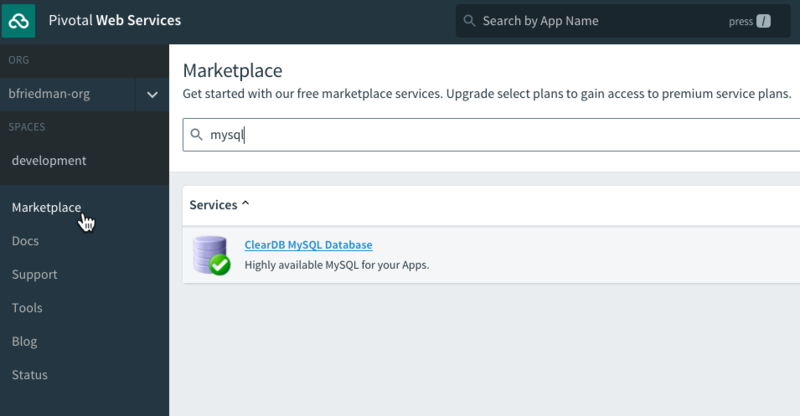 Since all the public cloud providers offer a MySQL product, that’s what I opted to use for my backend. To keep things simple, I used the Java Persistence API (JPA) and took advantage of the auto schema creation feature. (More info in the Spring Boot documentation. My code was also heavily influenced by the Entity-User example on the Spring “Accessing data with MySQL” Getting Started Guide.) Obviously, the create setting I used is not something that should be left on for production code. This doesn’t take care of actually creating the database, only the tables within the database. We’ll still have to create a database for the app to connect to. For each PaaS, I’ll use the UI as well as the CLI where possible. I’ll configure the app and database, deploy the code, then finish with a quick manual test to make sure it worked. Back to the wizard. We enter the application name and set the platform to Java (not Tomcat which will expect a war file, not a jar file). We upload the jar file right here as well (ignoring the fact that it asks for war or zip only). 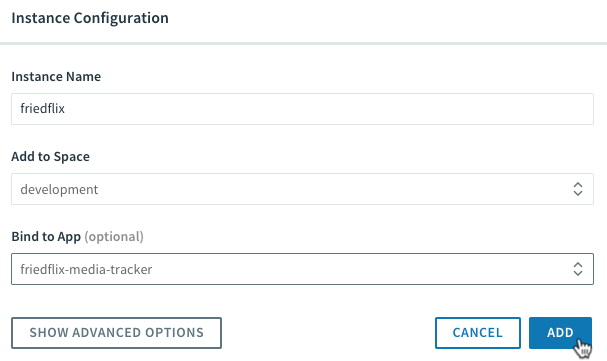 We could set up a few more things we need in the Configure more options sections, but we’ll wait and do it later. Click Create application and it spins things up. 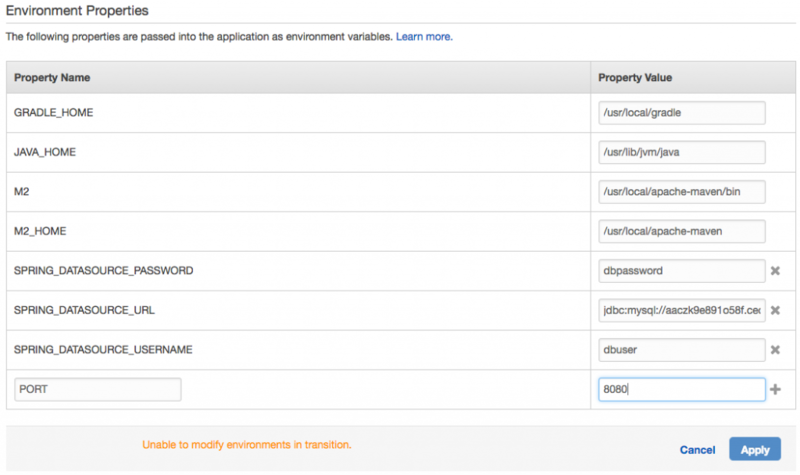 Once deployed, the app will be available at http://<ENV_NAME>.<ID>.<LOCATION>.elasticbeanstalk.com. Don’t forget, we need our database too. Amazon’s RDS offering makes this pretty easy. There’s a handy link at the bottom of the Configuration screen in the EB Management Console for our application. We can quickly spin up a MySQL instance with it. The last thing we have to do is set our environment variables. With EB and RDS, there are environment variables built-in that we could have used (like RDS_DB_NAME, etc.). Instead, we need to set the Spring-specific ones. We do that by clicking the Software Configuration gear and scrolling down to the Environment Properties section. Set the database connection info and also the port, since Elastic Beanstalk will assume port 5000 while Spring Boot defaults to 8080. After applying the environment properties, EB restarts the app for us. So once it’s up, we’re done! EB makes a lot of assumptions, which tends to make things simpler. One example where I had to override a default, though, was with the port number. I’d say the Elastic Beanstalk experience is one of the better ones I’ve had with AWS products in general. It’s pretty seamless and was the lowest friction setup of the three public clouds I tried. Actions tended to take a pretty long time. Setting the environment variables restarted the app, for example. Also, there isn’t really a queue of activity to follow, so it wasn’t always clear what was happening. When using the web interface, a manifest file wasn’t required. Once entering CLI-land, it’s a necessity. Hiding it in the .elasticbeanstalk directory isn’t super user-friendly though. I had to check the docs on that one. I’m saving my Day 2 ops post for another day, but just a brief note on logs. (I ended up needing to view them to see what wasn’t working at first.) While there doesn’t seem to be a native streaming log interface, it wasn’t hard to find the logs. Except it was a tad annoying having to download either the last 100 lines or the whole thing every time. There is a decent CLI option here though (eb logs). First, we create the web app. No code needed at this point. Once up and running, the app will be available at http://<APP-NAME>.azurewebsites.net/. Once it’s done creating, we click the newly-created web app in the App Services area. We need to go change the Application Settings to enable Java because it’s off by default. Now we’re ready to upload the code. 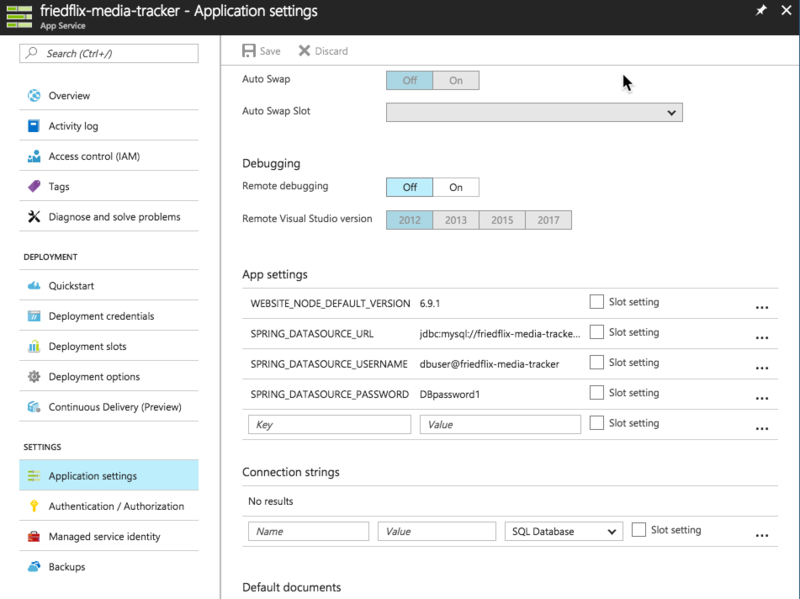 There are a few different ways to do it using the Deployment Options menu. 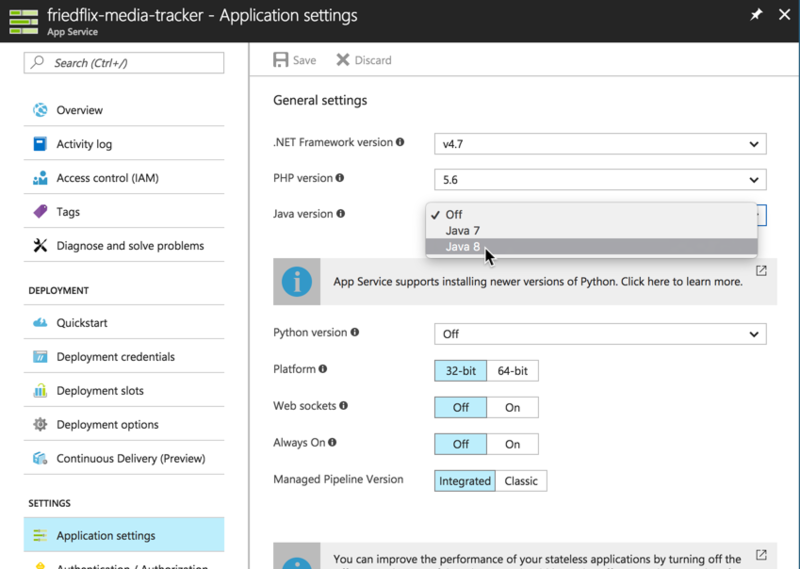 Azure App Services offers integrations with developer IDEs and source code management tools. I just want to upload my jar file3. The web deploy option that integrates with IDEs does have a CLI (msdeploy.exe) but it’s Windows only. No Mac support. So the best option for me in this case is to use FTP. It wouldn’t generally be my first choice, but at least it’s scriptable. (It also supports FTPS). To make this work, we have to set up FTP credentials in the Deployment Credentials section. Then we can get the connection info from the app Overview area. We’ll use the standard FTP put command (or your favorite FTP client) to upload the jar file to the site/wwwroot directory, along with a manifest file to specify how to run the app. Now we have to deal with the MySQL database instance. 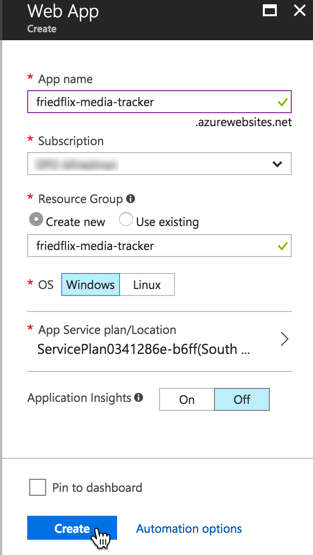 MySQL In App is offered as part of the Azure App Service, but it’s hosted on the same instance as the app and isn’t intended for production use. There is an option from ClearDB we could use. As it turns out, though, Azure recently released a preview version of Azure Database for MySQL. We’ll try it out. After creating the instance, we have to take care of some things. First, we need to adjust the firewall rules to allow the app instances to reach the database. We do this in the Connection Security settings, but we have to lookup all the outbound IP addresses for the app first. These are found under the Properties section of the app service. Notice I also add my IP (with the + Add My IP button). This is so I can connect to the instance from my machine and create the actual database, as previously mentioned. 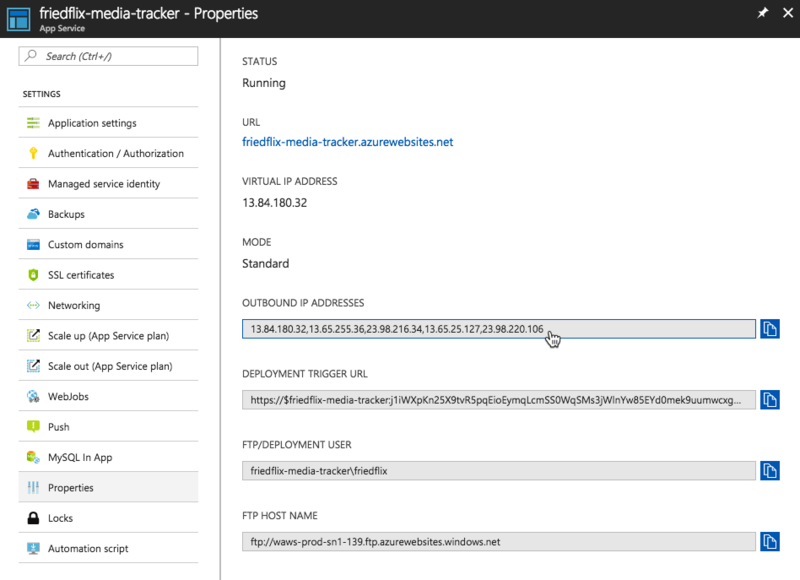 We grab the database server name and login details from the Overview area of the database instance in the Azure portal. Finally, we set the environment variables for connecting to the database. Now all we have to do is reset the app, and we’re all good. My past experiences with Azure have often felt overwhelming. It seems like there are almost too many options. It’s true here too. Even when first creating the app, it wasn’t clear which “kind” of app to pick. 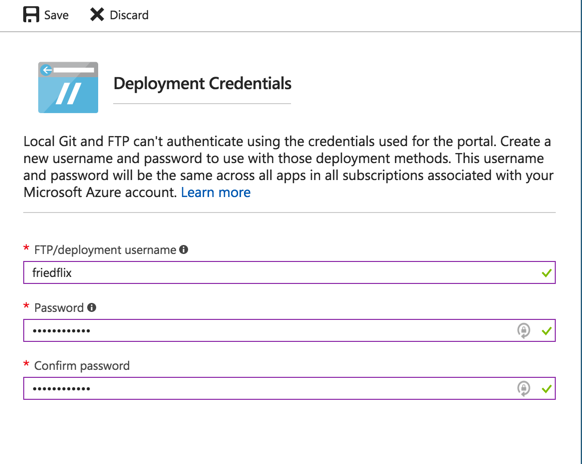 The Azure Portal UI is notably bad. I’m not a fan of the blades and endless scrolling through settings to get what you need. Use the CLI whenever possible. After the AWS experience and also being familiar with Cloud Foundry, it felt weird not to provide code to get started. I ran into a stupid problem of not setting binary mode when uploading my jar file through FTP. Another reason not to use FTP. Most manifest files these days use YAML because it’s easy to read and pretty easy to write. Having to use XML here wasn’t the greatest. 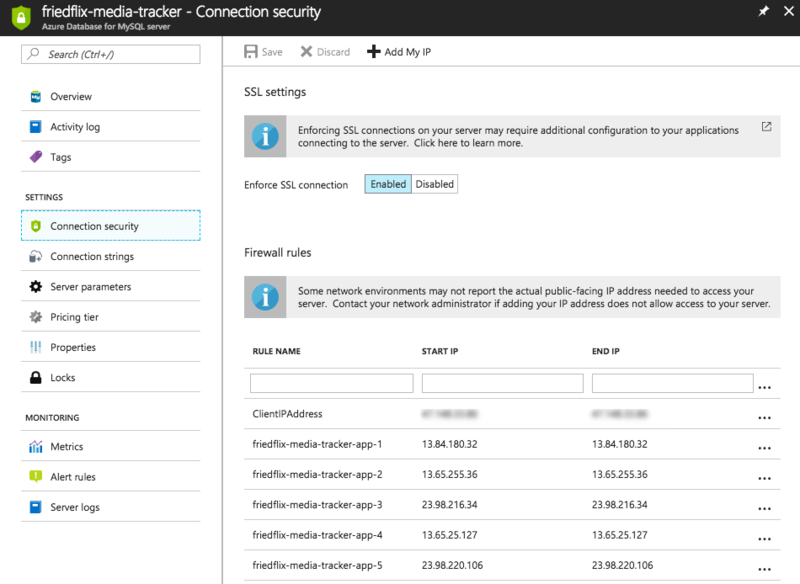 The interface for adding firewall rules is worse here than I’ve seen anywhere else. Even if you opt for the CLI, you still have to start by looking up the IPs for each instance. 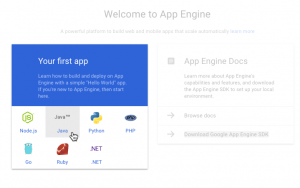 Google App Engine (GAE) is the PaaS offering on the Google Cloud Platform (GCP). 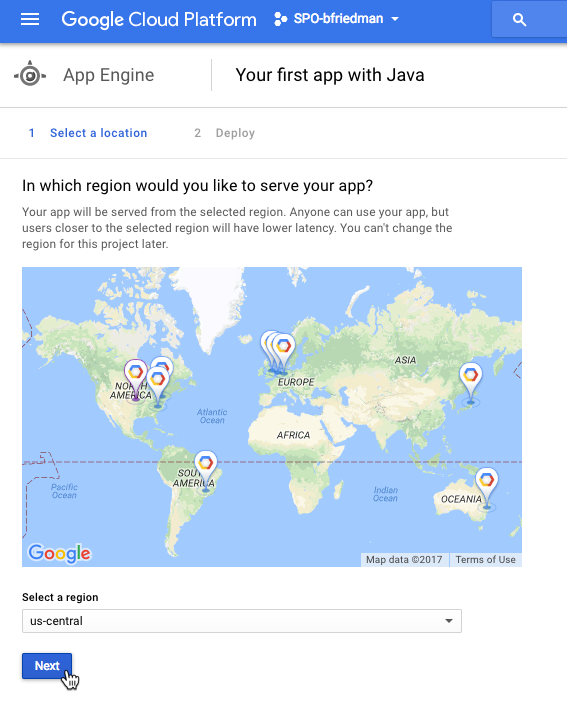 For each project in GCP, users can create one app. Each app lives at https://<PROJECT-NAME>.appspot.com. It supports one app per project, but has multiple versions that can each host a certain percentage of traffic. It’s slightly reminiscent of the application/environment construct on AWS EB, but it’s really pretty different from what I’ve seen on other platforms. It’s an interesting way to roll out new code to subsets of users or manage blue-green deployments. To start, we create the app. Again, no code needed yet. We’ve got our app, now let’s set up the database. We create a MySQL Second Generation database. 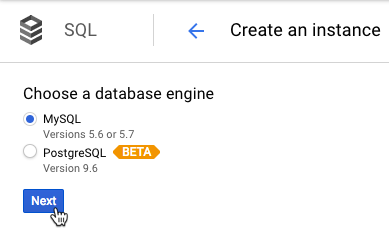 The nice thing with Google’s interface is that we can actually create the database in the instance right from the portal (or the CLI). No need to log in to the database with a MySQL client. Once again, this can all be done with the CLI. We’re almost ready to get our code out there. First, we specify our app.yaml manifest file in the src/main/appengine directory. This is the only place where we can enter the environment variables to specify our database details. With GAE, we won’t be just uploading the jar file like with all the other services. 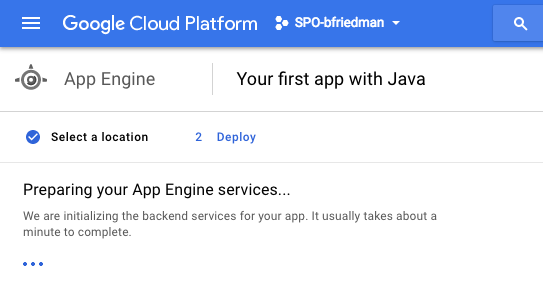 There doesn’t seem to be a way to do this, so we’ll take advantage of the appengine plugin for Maven. To do that, we have to add it to our pom.xml file. 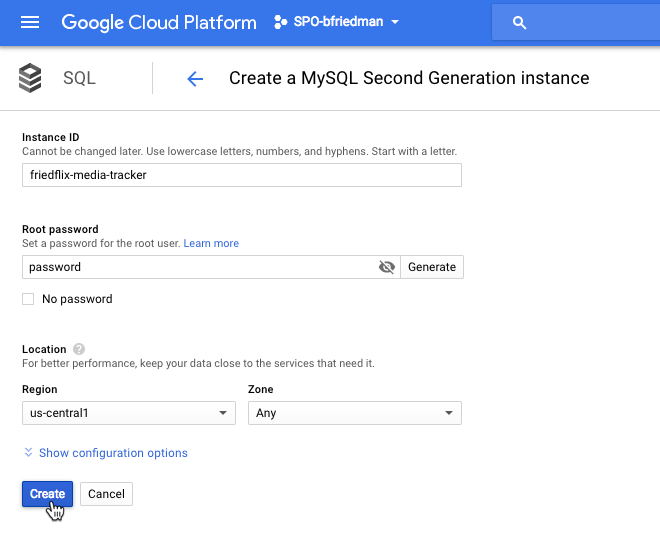 To connect to our Cloud SQL database instance, we specified a special JDBC connection string in our manifest that makes use of the Google Cloud SDK. The benefit here is that we don’t need to configure any firewall rules or special settings on the database. The downside is we have a few additional dependencies we’ll need to include in pom.xml. Now we can push our app. We’ll use the Maven plugin we enabled. It takes a while, but the command does complete successfully and we’re up and running. If you’re not used to the paradigm of one app per project with multiple versions, it’s not entirely clear at first. I deployed a lot of versions inadvertently until I figured out the whole traffic splitting thing. I had used GAE before, but it was a while ago so things were pretty different. Google’s portal UI is usually pretty solid, but it did take me a bit to figure out exactly how things worked here. Again, not providing the code up front felt strange. The CLI is easy to use and I preferred it to the portal in most cases. It was very neat to be able to create the database from the UI or CLI without logging into MySQL. It would have been nice to be able to specify environment variables as well, though using the manifest was fine. Using the Maven plugin was okay, but I would have liked the flexibility to just provide a jar file and call it a day. The only way I could figure out to do that was to use the custom runtime and specify the commands to run it in a Dockerfile. I wanted a more pure PaaS experience, so I didn’t go that route. I ended up needing a fair amount of documentation here too, but it was almost all about connecting to the database. The Cloud SQL dependency stuff was not documented super well. I had to use pieces of documentation from here and here. Even then it required some trial and error to finally get working. The deployment took a pretty long time. The CLI gave little indication of what was happening, but I was able to follow along with the streaming logs in the portal. Pivotal Cloud Foundry (PCF) can run on many cloud IaaS offerings, including AWS, Azure, and GCP, as well as vSphere or OpenStack for on-premise deployments. For this exercise, I will take advantage of the Pivotal Web Services (PWS) offering. PWS is a public, online, managed PCF environment. It comes with an existing marketplace of services like MySQL, RabbitMQ, and Redis. Each app lives at https://<APP-NAME>.cfapps.io/. While there is a web UI for managing apps and services, a deployment on PCF happens from the cf CLI. Each user of PCF has access to one or more orgs and spaces. These are constructs for multi-tenancy and separation of app environments. We can see (or set) which endpoint, org, and space our CLI will connect to with the cf target command. Mine is set to target my space in PWS. Everything starts with the cf push command. We can choose to specify required parameters using the command options, or we can use a manifest file. For now, we’ll just use the -p option to target our jar file. This will push our app, but we’ve specified that we don’t want to start it yet. That’s because we still need to create a database and set our environment variables. We can do that from the UI. 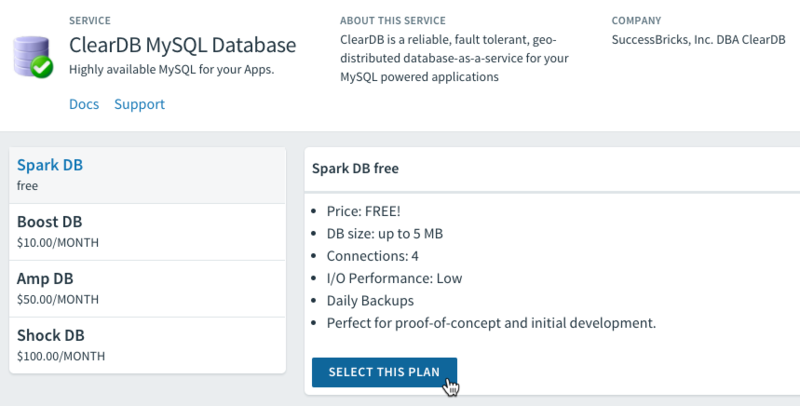 We’ll use the ClearDB MySQL offering and choose the free Spark DB plan for now. We name the instance and we can even bind it to our app from here. UPDATE: Turns out we don’t even have to do this step at all! 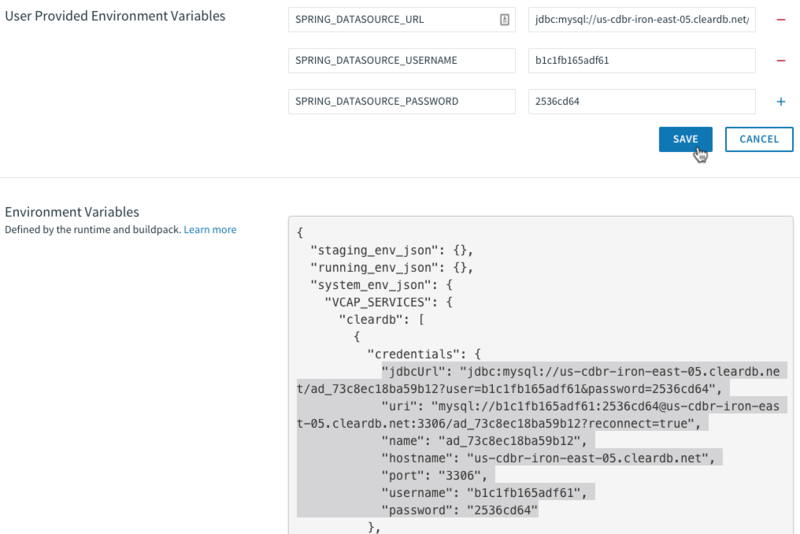 Spring Boot magically detects the database automatically (by looking at existing Cloud Foundry environment variable VCAP_SERVICES) and autowires the configuration for us at startup. Even easier than I thought! We start our app and we’re good to go. Before too long, the app is up and running. The web UI is a bit limited, but that also means it’s very simple to use. There’s real power in the CLI, but the UI is a nice addition for some things. The elegance of creating and binding the database service wasn’t matched on another platform. In fact, the act of binding creates the database for you, so it really did make it easier than any of the other platforms. Setting the environment variables to reference the service properties is awesome. 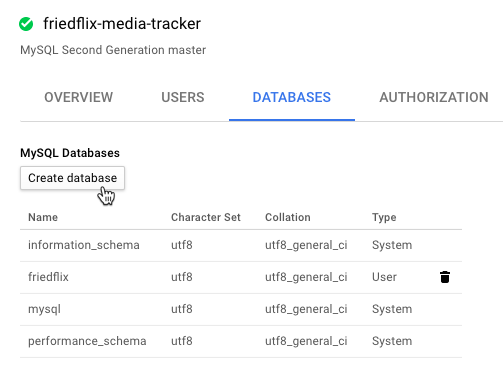 Only the Google SQL connector was close to the ease of deployment, but it required lots of code dependencies. Granted, I’ve had experience using PCF before and all the other platforms were basically new to me. Still, I did have to reference documentation a few times to look up manifest file values and things. Even so, this took me the least amount of time of all the platforms and I ran into the fewest problems starting the app. Each platform had its strengths and weaknesses, as we’ve seen. All the platforms I looked at here are opinionated to some degree. They all make some assumptions about the application and desired configurations. Yet they all let the developer provide customizations and specific settings. Pivotal Cloud Foundry seemed to be the most opinionated platform of the bunch. This made it the most frictionless for getting an app deployed. The breadth of services offered by the big cloud providers is very nice though, depending on what you need. This was a pretty simple example, but each platform might make sense for a given workload. I’ve also only explored the deployment process here. There is a lot more to discover around Day 2 operations. Once it’s out there, we still need to manage and monitor our app. How do we scale it? How do we do health management? Observability? I’ll take a look at the options each platform provides in a followup post. Stay tuned! I suppose you could consider the third approach of using a PaaS-only provider like Heroku. I didn’t consider that here. A better option might have been to use the Azure Container Service. Or maybe I should have chosen to write a Node.js app instead. Either way, that’s a separate blog post for another day. I tried to avoid using IDE or source code repository integrations for this exercise. The right thing to do would be to write automated tests and wire up a CI/CD pipeline to push the code to the platform. (Since I’m not a real developer, I did not write tests, although Spring does make that pretty easy.) Yet another separate blog post for another day.